Sea of Galilee continues to rise, April showers expected to continue. The Kinneret's (Sea of Galilee) water level rose 11 centimeters in a single day, and 15.5 centimeters since Friday. 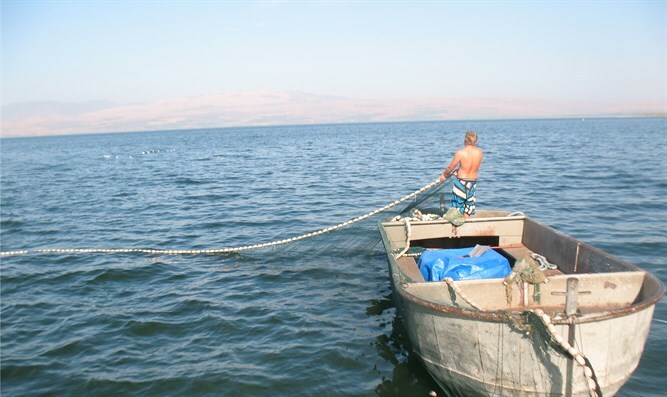 Currently, the Kinneret stands at 211.96 meters below sea level, 1.04 meters above the lower red line, and 3.16 meters below the upper red line signaling that the lake is full. Rain is expected to continue falling intermittently in northern and central Israel, and there may be isolated thunderstorms. Temperatures will be lower than seasonal average. Snow may fall on Mount Hermon and there may be haze in the south. During the afternoon hours, rain will fall mostly in northern Israel. Monday night will see local rain in northern Israel and along the coast. Northern Israel may see thunderstorms as well. Tuesday will be partly cloudy or cloudy, and local rain may fall in northern Israel. Temperatures will remain lower than seasonal average. Wednesday will be partly cloudy. Temperatures will rise but remain slightly lower than seasonal average. During the afternoon hours, local rains will fall, mostly in southern Israel. Thursday will be partly cloudy, and temperatures will rise to seasonal average.